Here’s the first set of new discoveries we’ve made this year at WonderCon in Anaheim, California. Christopher Lee (no, not that one) is a graduate from the California State University at Sacramento who majored in graphic design. After working for graphic magazines, toy companies, and special effects studios, he made the bold choice to go solo as a graphic-designer-for-hire. To that end he has created a series of prints, t-shirts, and other items which he sells on his web site, www.thebeastisback.com. 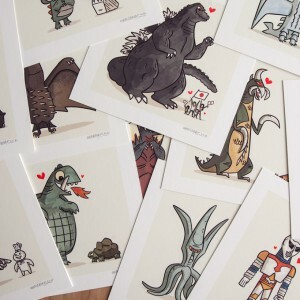 Among the items he’s created is Kaiju Romance, “Twenty two of your favorite giant monsters from the Gamera and Godzilla franchises falling in love in unexpected ways.” Each of these 5 x 5″ cards was hand-finished, making each one unique, and they’re available now as a set.